First a personal note. Here is a book that I first read 50 years ago, at the time when it won a Hugo award. I loved it then. It made a lasting impression. It is enlightening to see how my memory of the book contrasts with my current impressions. Back then I was struck by the wildly imaginative setting and several of the vivid scenes. What impresses me now, apart from the author's far-reaching imagination, is his skill at constructing the tale. Using a rich vocabulary and engaging prose, Aldiss actualizes a setting some five billion years in the future when the sun is about to go nova and burn all life on Earth to a crisp. He brings this world to the reader by populating it with well-realized characters who face conflict with a seemingly endless array of threatening new life forms. This is a world dominated by vegetation. Plants have assumed the niches formerly occupied by most animals, and the animals have largely gone extinct. Some plants can see, though none can hear. Some are able to walk or crawl or fly, though always crudely compared to their animal counterparts. There is one vegetable creature, taking the form of a giant spider, that has conquered outer space and now spins its webs between the earth and the Moon. Is this plausible? Is it sci-fi? More on this later. The plot centers on Gren, an inquisitive and rebellious adolescent male in a tribe ruled by women. The elders of the tribe declare that it is time for them to 'Go Up' - presumably to their death - leaving the youngsters to establish a new social order. In the uncertainty that ensues, Toy is the young woman who assumes leadership. Because Gren questions Toy's decisions, she banishes him from the tribe, and another young woman, Poyly, sides with Gren. Without the support of a tribe, Gren and Poyly are not likely to survive in this hazardous world. But a morel - a brain fungus with the knowledge of a sage - parasitizes both of them and helps them successfully negotiate all challenges. However the morel has its own agenda, and therein lies the conflict that is the focal point of the rest of the story. To say more would be to cross the boundary into spoiler territory. This book was first published in the UK under the title "Hothouse." I am delighted to note that "Hothouse/Long Afternoon of Earth" was recently re-released (2009) so that the current generation has a chance to experience this masterful tale. I hope this generation will come to the book without pre-conception, because it does not fit cleanly into the genre that Aldiss identifies with. There is an image problem. Reviews of this book have a bimodal distribution. People generally either love it or hate it. The common theme among the negative reviews is that it is not science fiction. I have to agree. Though I don't pay attention to labels and don't make reading decisions based on them, I can see where others might be put off by unmet expectations. If this book were identified to readers as a Fantasy, no one would object to the metaphysical scenes and concepts. That is the crux of the image problem. The more inflexible hard-sci-fi enthusiasts don't like their unswerving faith in reductionism challenged by an example of emergence and irreversible evolution that could undermine their static 'fact-based reality' paradigm, even if the example is fictional. These poor vulnerable victims of the grand enlightenment should have been forewarned. Brian Aldiss was named a Grand Master by the Science Fiction Writers of America in 2000 and inducted by the Science Fiction Hall of Fame in 2004. He will celebrate his 89th birthday in August 2014. As far as I know he is still active and still thinking so far outside the box that "the box" is little more than a quantum fluctuation amid the profound diversity of reality. He has lived long and prospered. May he continue to do so. Without giving away too much about 'Hothouse/Long Afternoon of Earth' or about my own distant future sci-fi/Fantasy novel series 'Eden's Womb' I want to note that Aldiss and I both share a thirst to explore the distant future, to speculate about the fate of mankind, and to understand our place in the cosmos. 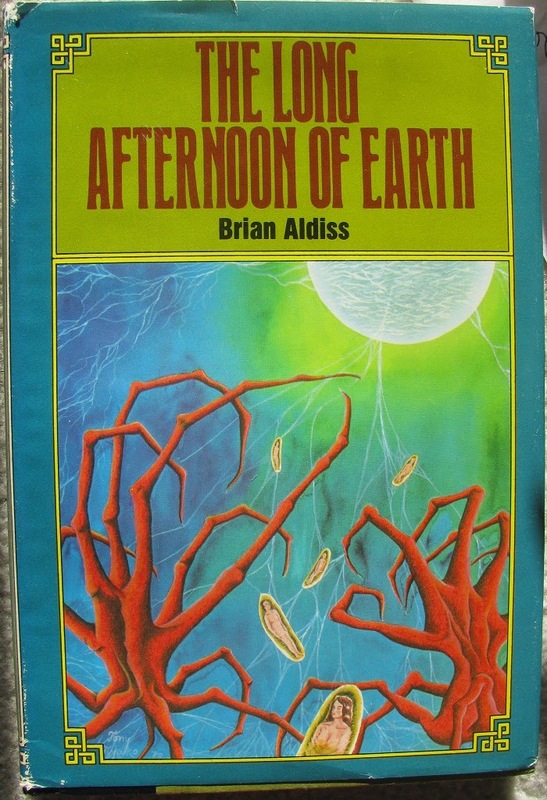 Fifty years after first reading 'Long Afternoon of Earth' I cannot quantify the degree to which Aldiss's book influenced mine, because I ran across many other inspirational sources along the trajectory to my book, and because my original book concept was set just a decade or two into the future. 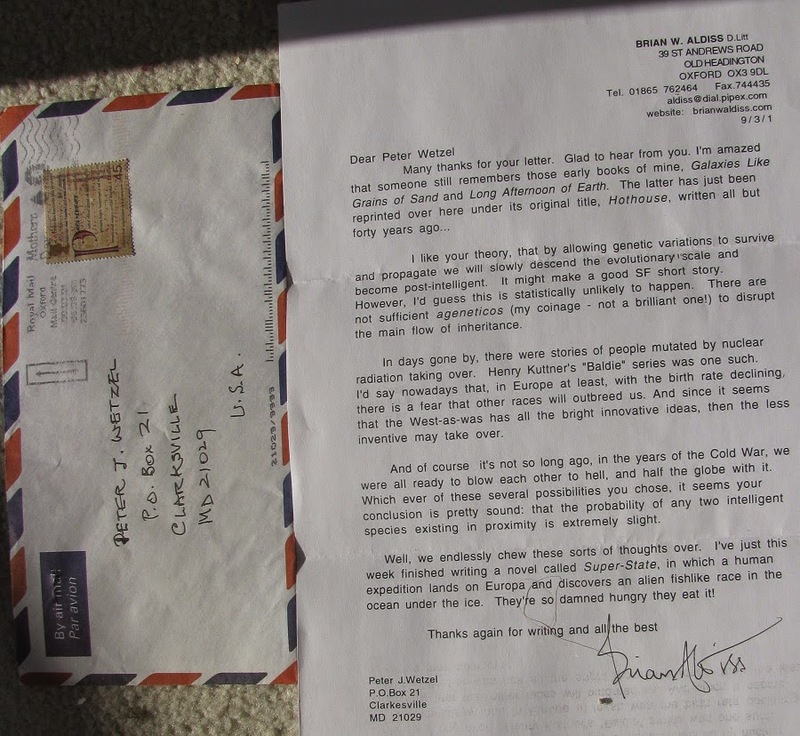 In 2001, after seeing a commentary that Brian Aldiss wrote in the journal 'Nature', I wrote him a fan letter. To my delight he replied with an obviously personalized and thoughtful response. This is a letter I will always treasure. Personal letter from Brian Aldiss. The addresses are obsolete. The over-arching themes of 'Hothouse' and of 'Eden's Womb' are the same. As you can see from the letter (and from Aldiss's original commentary in 'Nature') we both believe that humans find themselves effectively alone in the universe because of the unfathomably short time span during which we have been capable of interstellar communication using radio signals and the vast distances to other similar, putatively short-lived civilizations. To guess the longevity of intelligent beings' radio technology, we have a statistical sample of one. If we are anywhere near the center of the statistical distribution (and it is sheer fantasy to assume otherwise), one must conclude that the capability for interstellar communication among 'intelligent' beings lasts barely two centuries (one that we have lived through and one more that is to come as the ability tails away because of the possible forms of decay, including those discussed in the letter, social upheaval, economic crisis, global pandemics caused by mutated microbes, major earthquakes, and/or mega-cyclones). We are a needle in an unimaginably giant haystack. Two centuries is 0.0000014% of the life of the universe. The probability that two civilizations will coincide--exist simultaneously in relative time--is therefore one in five hundred billion. Current estimates are that there are *only* 8.8 billion habitable planets in our galaxy. Rounding up to ten billion, that means that we would have to flawlessly separate cognitive radio signals from random noise coming from every one of the fifty nearest full-sized galaxies before we would have a 50/50 chance of finding just one civilization like ours.